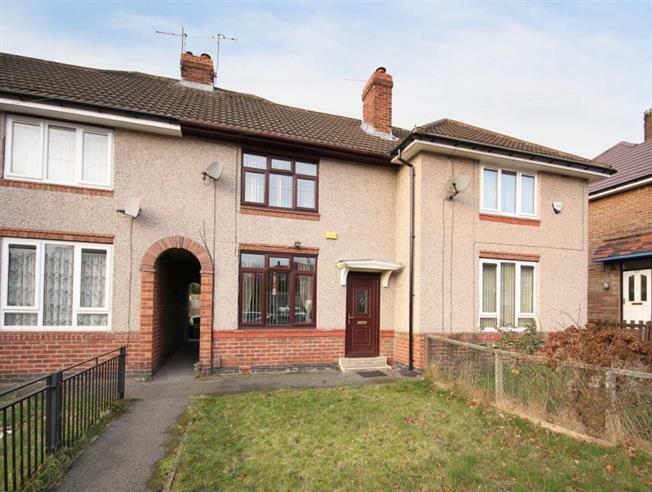 2 Bedroom Terraced House For Sale in Sheffield for £85,000. An internal inspection is highly recommended to appreciate this beautifully presented two bedroomed town house, located in the heart of this popular and convenient estate. Offering accommodation over two levels with the benefit of double glazing, GCH, front and rear gardens. Ideally located for the full range of excellent amenities including local shops and supermarkets, schooling, public transport links, Wadsley Bridge retail park, Hillsborough with Leisure centre, park and library and Supertram network. The property comprises an entrance hallway with stairs to first floor landing, the Lounge has window to the front, carpeting and living flame effect fire focal point. The dining Kitchen has been fitted with an excellent range of base and wall units in a shaker style with contrasting work surfacing and uplifts, inset sink, integrated oven, hob and extractor, rear window and access door. On the first floor, the spacious Master bedroom has window to the front and useful walk in over stairs cupboard. Double bedroom two is carpeted with window to the rear. The Bathroom has three piece suite in white comprising WC, wash basin and bath with shower over, tiled splash backs and rear window. To the exterior of the property is a garden area to the front and lawned garden area to the rear with decked area providing an excellent outdoor seating and entertaining area.